The Mauser 77 was probably the best rear locking modern bolt action to appear in the seventies and eighties period when manufacturers were trying to “modernize” their bolt action rifles with moves to push feed as opposed to controlled feed actions. In Europe there seemed to be a concerted effort to move away from the traditional front locking actions such as the Mauser 98 and instead to create rear locking actions, which we saw on the Steyr Mannlicher and JP Sauer/Colt Sauer. American manufacturers mostly did not attempt to move to rear locking actions although Remington dabbled with it with their Model 788. The Mauser 77 was the successor to the Mauser 66 designed by German gunsmith Walter Gehman. (Picture courtesy naturabuy.fr). As Mauser progressively moved back into sporting arms manufacture they began with the Walter Gehman designed Mauser 66. This action used a telescoping bolt thus making the action significantly shorter than standard yet able to accommodate cartridges up to the .375H&H. The magazine was integral and the bolt used a push feed system with two front locking lugs. 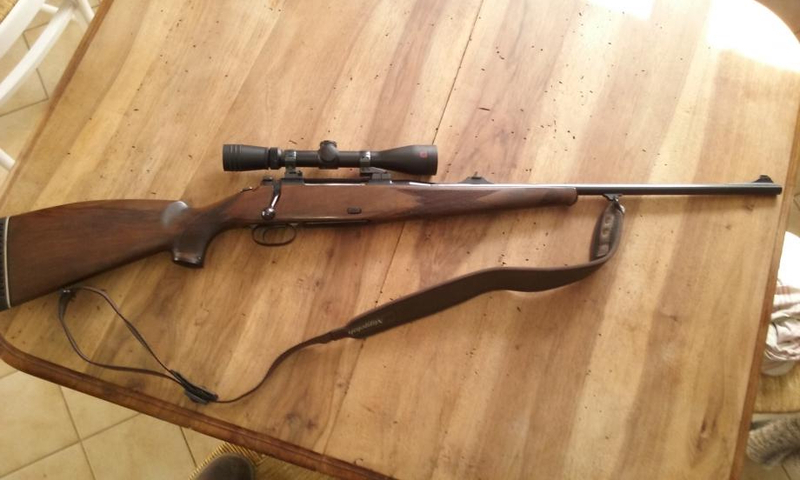 It was a pure bred hunting rifle with limited magazine capacity but exceptionally well made. 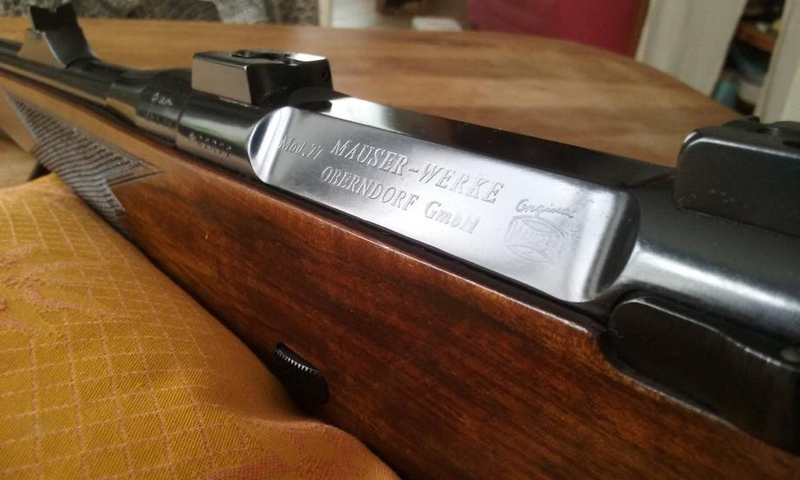 You will find our Revivaler post on the Mauser 66 if you click here. The Mauser 77 was an effort at ensuring a rifle with a detachable magazine that could accommodate more capacity for culling work. The safety catch is mounted on the bolt shroud. The small button on the right side of the tang is to set the set trigger mechanism. (Picture courtesy huntershouse.dk). Mauser initially moved to create another model which used a more simplified traditional bolt action more like the Mauser 98, this was the Mauser 2000/3000/4000 series and they were manufactured by German maker FW Heym. Heym also sold these rifles as their Heym SR20. They featured a standard two front locking lug bolt with a push feed, plunger ejector and a bolt guide rail with the right locking lug slotted for the rail. They were a nice enough rifle but they were simply not a replacement for the Mauser 98. Something better was needed and so Mauser’s engineers got busy and created the Mauser 77. The Mauser 77 took a similar approach to the Sauer and Steyr rear locking designs but kept things simple and solid. Whereas the Sauer used retracting locking lugs the Mauser used fixed ones. Whereas the Steyr used multiple small locking lugs the Mauser 77 used three nice big ones. It was an action with that “shutting the bank vault door” feel about it. Solid, beautifully made, and dependable. At the rear of the bolt on the bolt shroud was the safety catch. This was the same to operate as the safety on the Mauser 66; it had a push vertically forward action and had a small locking tab that needed to be depressed before it could be pushed forward into the fire position. To the rear of the safety on the right side of the tang was another small button. This was to activate the set trigger if a light trigger for a precise shot was needed. The button simply needed to be pushed forwards once, it would spring back when released and the trigger was set to a very light pull. If the shooter changed his/her mind and wanted to unset the trigger then one simply engaged the safety catch, and then pressed the trigger to unset the mechanism. Simple, convenient and safe. The shape of the trigger of the Mauser 77 was very conducive to accurate shooting. The trigger pulled directly towards the center of the hand. (Picture courtesy huntershouse.dk). Back when the Mauser 77 made its debut I was living down in Australia and was given the opportunity to shoot one of these rifles for a full course of the Australian Field Rifle match. This is a forty two round match which features “rapid fire” at 25meters, this being three shots in fifteen seconds, repeated four times for twelve shots, then ten shots offhand at fifty meters, ten shots standing post rest at one hundred meters, and ten shots sitting post rest at 200 meters. It’s a course of fire that is intended to duplicate typical hunting rifle scenarios and is a good way to practice for hunting season and to evaluate a sporting rifle. So this was an excellent chance to get to know the Mauser 77 and find out how nice to shoot it was. The rifle was in .308 Winchester and was fitted with a Zeiss riflescope that provided up to 10x, in EAW mounts. Suffice to say it was one of the best rifles I have ever had the opportunity to shoot. The action worked flawlessly the trigger was a delight to use both unset and set. It was a rig that felt and performed as a top shelf rig should. The rapid fire section of the Field Rifle match necessitates reloading at the shoulder and with the Mauser 77 this was easy to do. The Mauser 77 was typically capable of under MOA accuracy out of the box, the match versions being guaranteed to shoot under 15mm groups at 100meters. 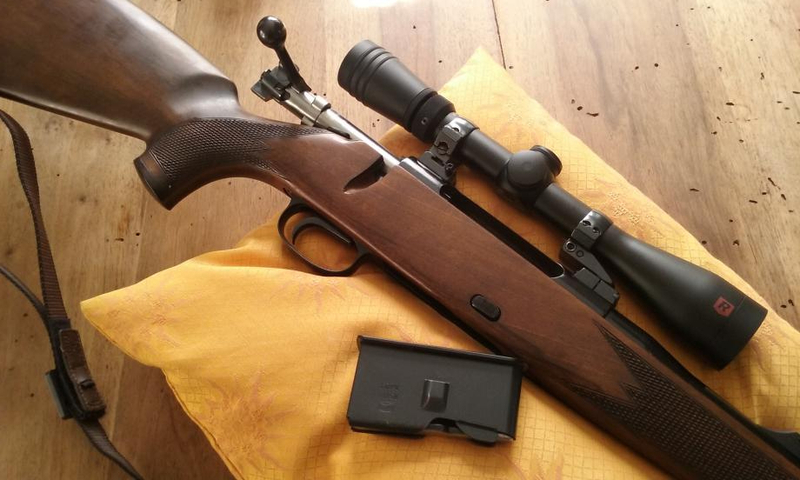 Sometimes when we borrow a rifle it is hard to give it back to its owner, the Mauser 77 was one of those. 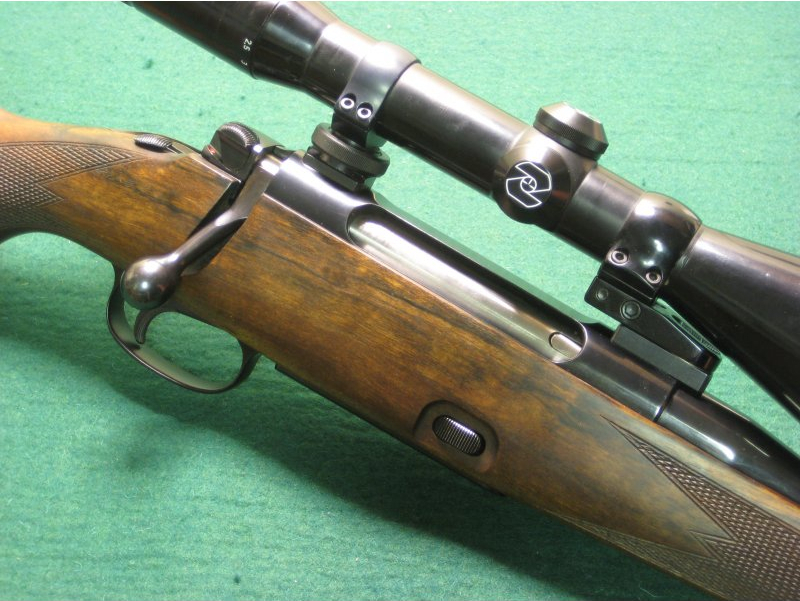 The standard sporting stock of the Mauser 77 was both pretty and pretty comfortable. (Picture courtesy naturabuy.fr). Technically the Mauser 77 had three rear locking lugs giving a 60° bolt lift. The locking lugs were part of the bolt handle assembly and not an actual part of the bolt itself. 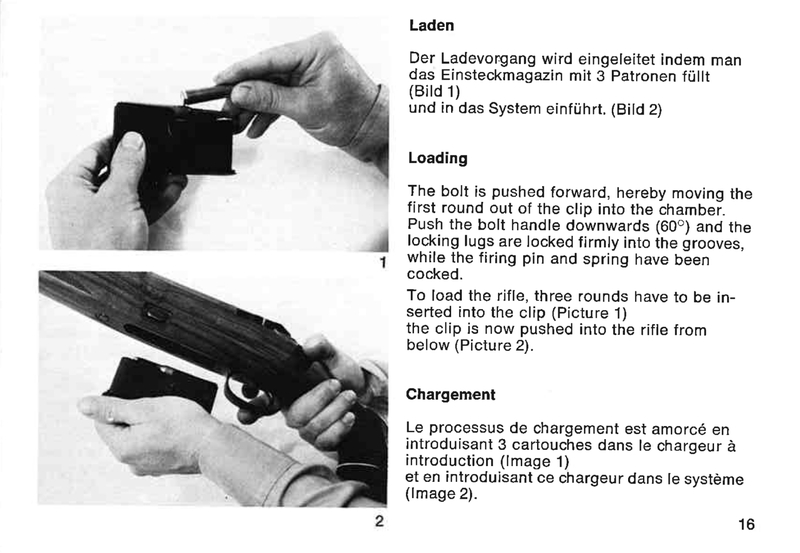 This picture from the Mauser 77 owners manual shows that the locking lugs are part of the bolt handle assembly, separate from the bolt body. To dismantle the bolt the catch on the top of the bolt is depressed and then the locking head is turned to the left. (Picture courtesy Mauser). 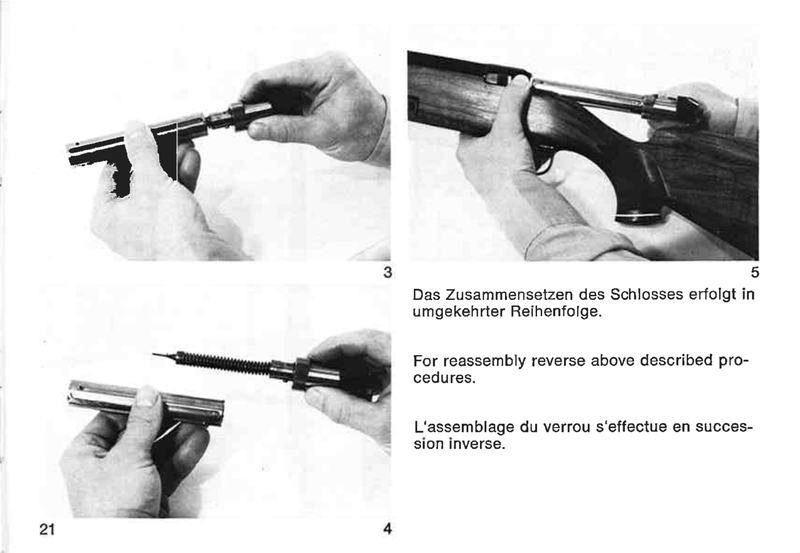 The firing pin was one piece which was preferable to the two piece firing pin of the Mauser 2000 series rifles. The detachable box magazine held three rounds for standard calibers. The magazine was detached by pressing the two buttons on the side of the stock simultaneously so the magazine would drop into your hand. The magazine was loaded with it removed from the rifle. (Picture courtesy Mauser). The Mauser 77 was available in Standard, Magnum and Big Game calibers from .243 Winchester up to 458 Winchester Magnum. 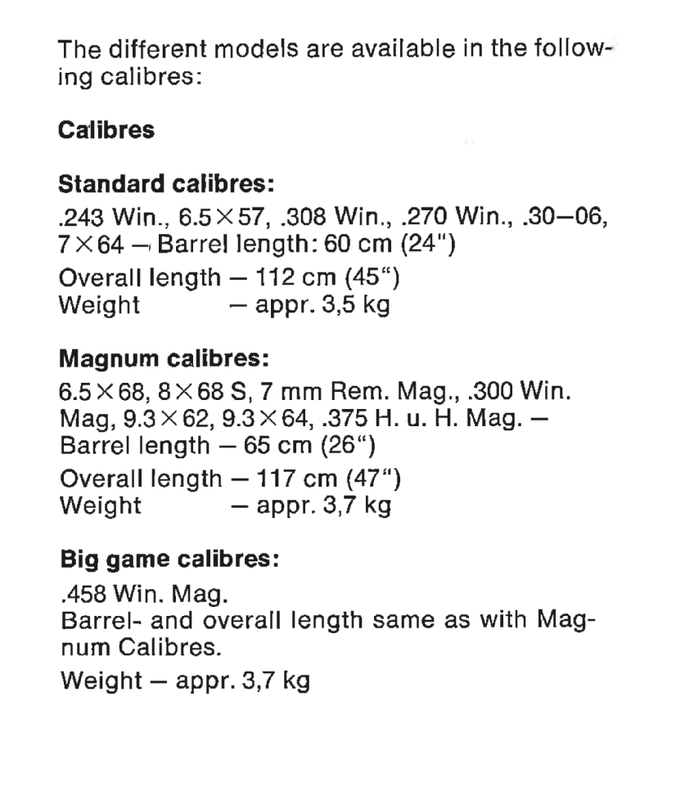 Calibers available for the Mauser 77. (Picture courtesy Mauser). The Mauser 77 was upgraded to the similar Mauser 86 in the eighties but remains a relatively rare rifle to find outside Europe. This is a shame simply because it was such an excellent design for a sporting rifle, superb to use. However, with its rear locking push feed action it was a rifle that would not have great appeal in the United States and its relatively high cost also served to keep it uncommon. Nonetheless if you get the chance to own one then examine the offered rifle carefully, and if all is good go for it. Decades later I still remember just how nice a rifle this was to use. As for Mauser they’ve produced a number of models after the Mauser 77 and the 86 ended production but they have gone back to once again making their controlled feed Mauser 98. There are some things in life that simply can’t be improved on. 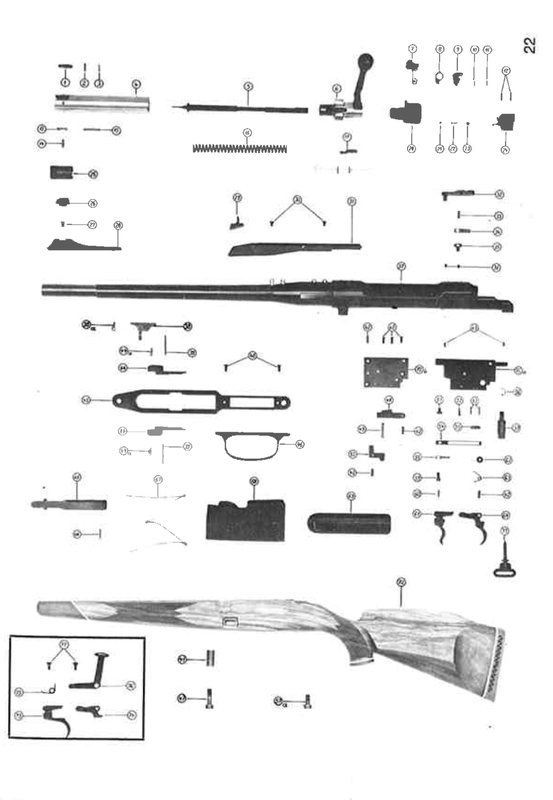 Exploded diagram of the Mauser 77. As can be seen there was a conventional double set trigger option in addition to the single set trigger as seen in the rifles in our pictures. (Picture courtesy Mauser). You will find the complete owner’s manual for the Mauser 77 on Mauser’s web site if you click here. (Feature image at the head of this post courtesy naturabuy.fr).